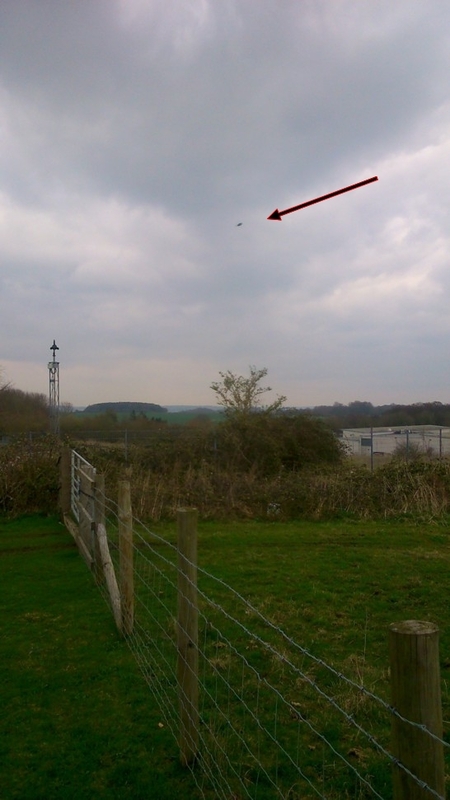 Statement: I happened to be at the science center in Winchester, Hampshire on April 05, 2015 and engaged in a daylight sky-watch for anything out of the ordinary; and as you can see from the attached images, I may well have had some success. 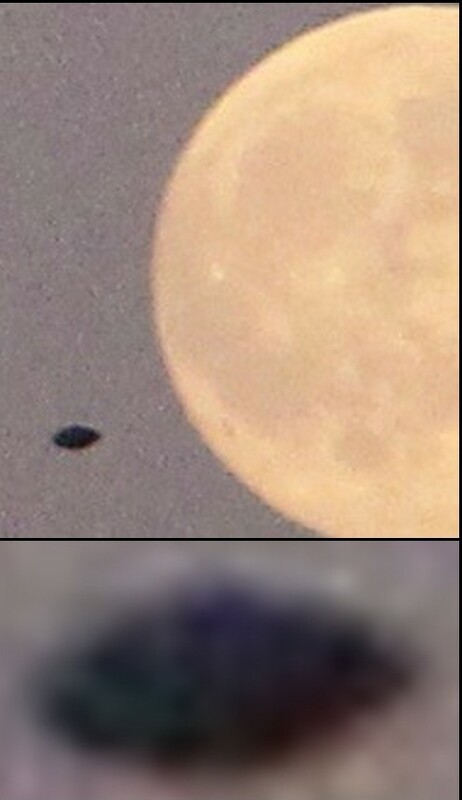 Although the anomalous object which is prominently shown in the initial image is clear enough, at the time the photograph was taken there was nothing visible to the naked eye; although having said this, those of you familiar with the UFO phenomena may be aware of the fact that UFOs sometimes operate in a manner which is suggestive of them being attuned in such a way, as to put them outside of the frequencies of light that human beings can perceive, but which are caught by cameras. We still do not understand why this is so, but it happens and that is just the way it is. 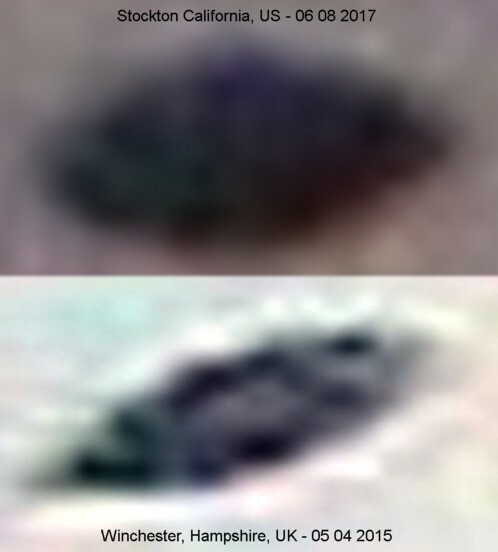 The first image (shown here) is of the UFO (literally an Unidentified Flying Object) as it was recorded at the time, and the following images show the same image zoomed in at 200x and 400x original magnification. Out of the numerous photos that I took here at this complex, DSC_0141 was the only exposure with something unusual on it: The previous and following shots DSC_0140 and DSC_0142 show no 'extras' on them; this is proof that the mystery object is at a distance from the camera, and NOT simply a piece of dirt or other debris stuck on the lens as some have suggested. Now those of you who are computer savvy will know about the manner in which JPEG images are created and stored and that they are prone to bit and byte errors which mean that fine details have a tendency towards corrupting and looking fuzzy when zoomed in, which does not help things when they have to be enlarged to reveal more detail. 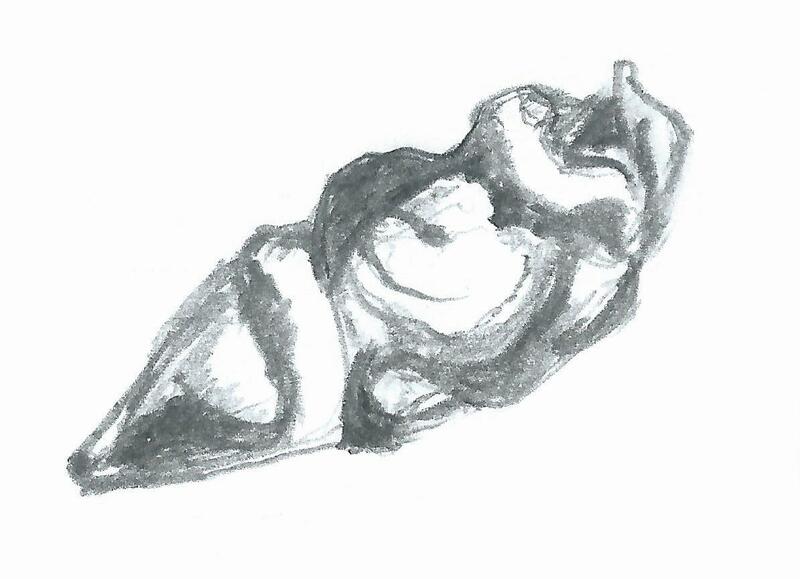 Such corruption is evident in the original image, (as a consequence of the way the image is captured and processed and stored) but in the second and third images this corruption has been subtly corrected as best it can be under the circumstances, in the hope of bringing out more detailing on the original shape of whatever this 'thing' was. If this was an insect as has been suggested in the press, we would be seeing discolorations and changes in image density which may well represent wings, no matter how blurred the image, but there is nothing to suggest they were there. There is also a curious discoloration, a lightening on what may be the underside or side of whatever this is - whereas an insect would be a uniform color, predominately dark in most instances. I've also added here a simple animation which shows a 400x enlargement of the object with one frame overlaid with circles showing what appears to be the possible location of shadows suggestive of structure. It's an interpretation of course, but it may be possible. 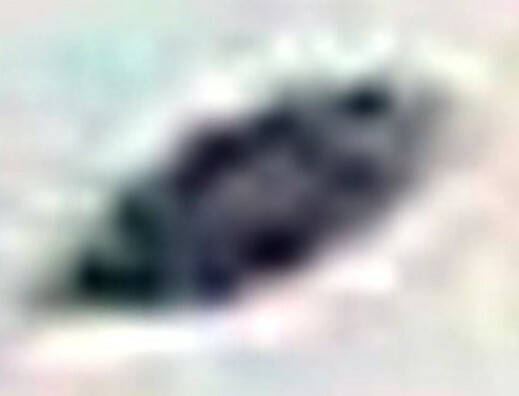 Although the press did an excellent job in reporting on the object, they choose to suggest what it might not be, over what it actually is, and that is that it remains UNIDENTIFIED as of this time.  'Recently this photograph was ridiculed in the popular press as being an insect rather than a UFO. Well, this is a common enough mis-identification, but it is actually quite simple to spot an insect believe it or not in digital photographs as there is usually tell-tale signs of wings, wherein the object that Parsons photographed clearly did not have these (as evidenced in the enlargement of the original image). Despite what has been written about this case, some might continue to dismiss our Winchester object as an insect, but we ask, if it were, what has happened to the wings? Furthermore, what insect in its flying adult form, more resembles a maggot, grub, or larvae, the form to which the Winchester object most closely approximates of anything known to science? Grubs, larva, or maggots do not fly or project through the air... but this object is certainly doing just that! Another obvious point. The Winchester object has no apparent legs, and for an insect there must be six of them. No six legs, no wings. No insect. I should remind the reader that UFOlogy is not an exact science. In fact it is not even considered a science, and is generally dismissed by the mainstream sciences as they are unable to obtain consistent evidence to be able to confirm it, thus providing a stable platform on which to develop a theory; so their response is to say it cannot exist because they cannot prove it exists. Very logical of them, isn't it? I suggest in all fairness that unless anyone can tell me with absolute certainty that it was something that they can identify absolutely - then it should continue to remain 'unidentified', and that it may possibly be something nobody in mainstream science is willing to address or discuss as it would mean a radical shift in their thinking. It's a familiar story... how UFOlogists and ordinary people who accidentally photograph such things every day around the world, have to struggle with the same issues which have been raised in the press since at least the early Fifties; some these people include Police officers or those in the military, and in such instances this can be a real wake-up call, because if they talk about what they saw or experienced, they can sometimes lose their jobs over it. Update: 06/08/2017 Same Object Captured Again... This Time in California! 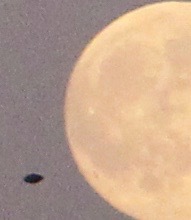 Black unidentified objects captured flying toward the moon. Made no sound, had no avation lights. 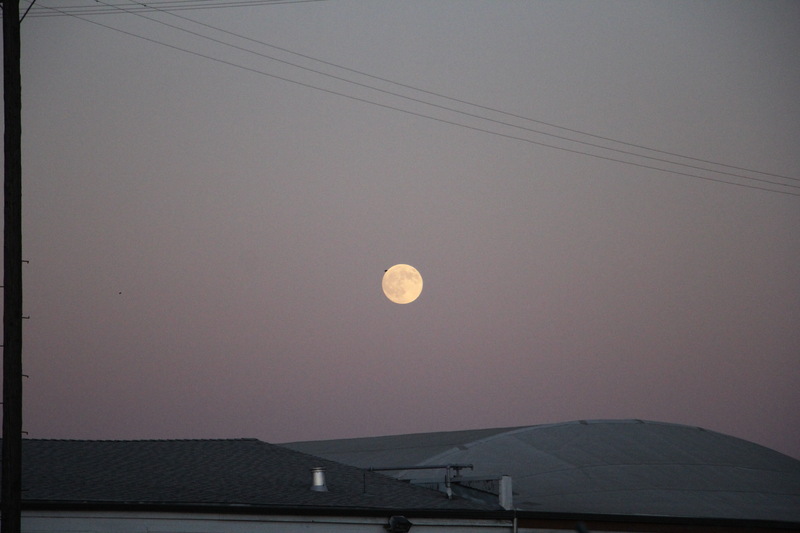 Witness statement: "I was taking photos of the full moon when I noticed a black object flying toward the moon and into my shot. It made no sound and had no lights. It flew from left to right then down, then hovered then back to the left. When I got home and dumped photos to computer I noticed that there were actually 2 objects in the photos. 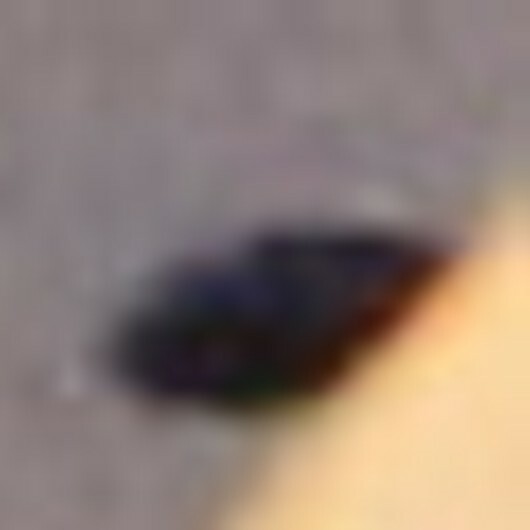 They were flying saucer shaped. I kept shooting but the objects were no longer visible. They just vanished." 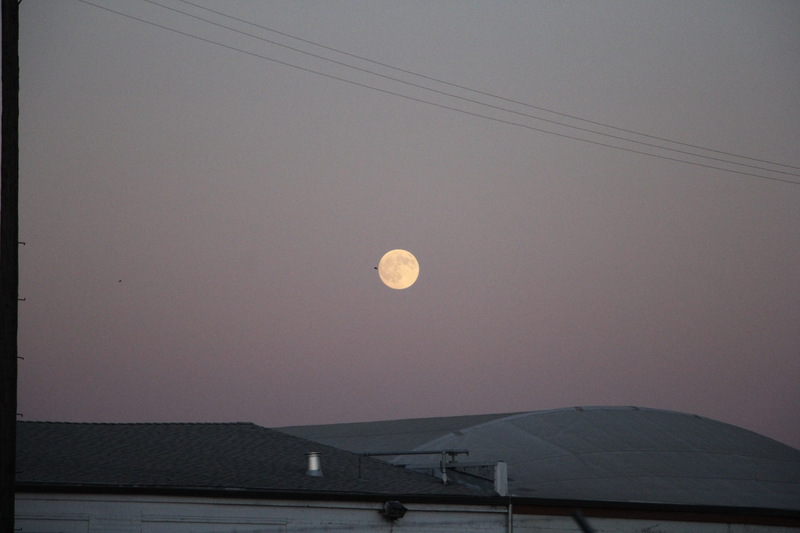 Bizarrely, this object seems to be either, leaving, going behind or going INTO the moon! Optical illusion? 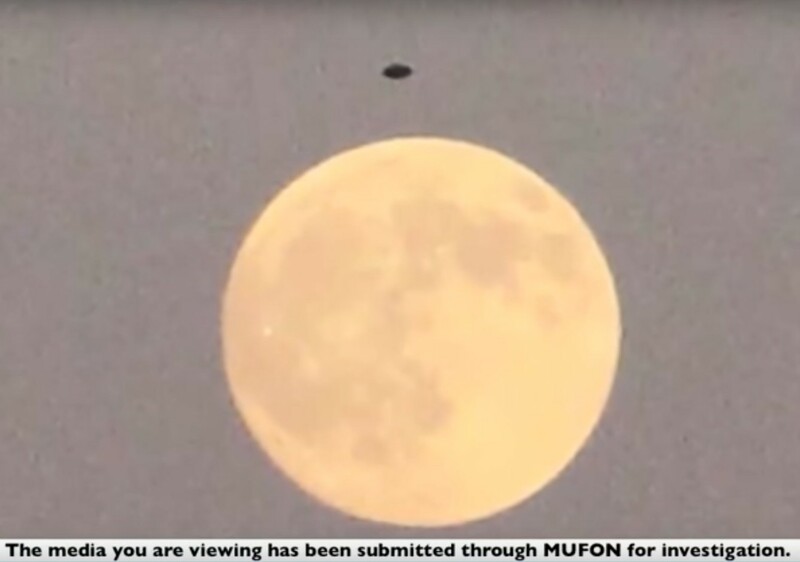 or are these mind-boggling UFOs actually enormous in size! and that the 2015 and 2017 UFOs are not comparable? For us here at BEAMS, the objects (from cases two years and approx 5,318 miles apart), are much the same. As already proven, these are NOT birds, and they are NOT any known insects - so what the heck are they?